and how they grow over the 4th dimension – time. and its all advancing in time. 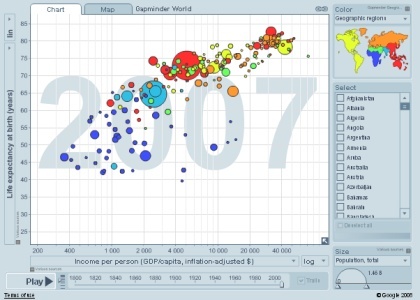 this default presentation shows Life expectancy over income per person, over population size. on of the things this tool does best is break myths. ans the same behavior can be seen for the US as well. but Google supplies a very similar tool through its Google documents apps. Thank you for your post. Cool to see that you are experimenting with Googles Motion Chart. I am sorry to say but as far as know there are no easy way of saving you motion chart on you laptop for off-line use. But then again, I am no expert on Motions Chart, it’s Googles tool. From what I understand it might be possible to create some kind of solution using the API and simulate a database i your laptop but that is beyond my knowledge. From Gapminders point of view, we will within shortly launch a downloadable version of our graph with all 500+ indicators in an desktop version. 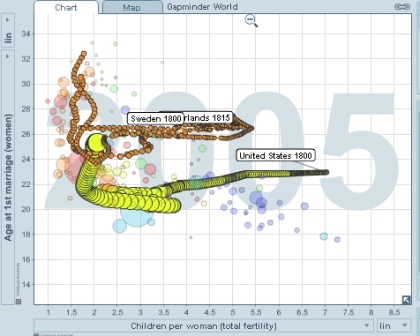 Keep your eyes on Gapminder.org or subscribe to our newsletter to get it when its launched. Thank you for the information! The way you displayed the information is absolutely devastating! All of my friends will know about this site!